This quaint and colourful little craft is a distinctive feature of the Shanghai Harbour. It is called the hung-t'ou or red head, because of its painted bow, but is more commonly referred to as the mu-chi, or hen boat, for its supposed resemblance to that fowl. Actually, if one were to liken it to a bird, a duck would be a better choice, for it is squat in appearance, with a turned-up tail, and rides the river like a duck. These boats are entirely Chinese in design and construction. It would seem that they owe something to Amoy influence. Their history is obscure, but the fact that they have no guild would seem to point to a comparatively recent origin. They are preferably built of Foochow pine, but if this is unavailable, softwood from Ningpo is used. The bulkheads are made of hsiang-chang , a hardwood from Kiangsi. The timber is supplied by the merchants in the form of chang-pa-t'ung, that is to say, poles of 1 chang 8 ch'ih. These sampans are all built in or near Shanghai. 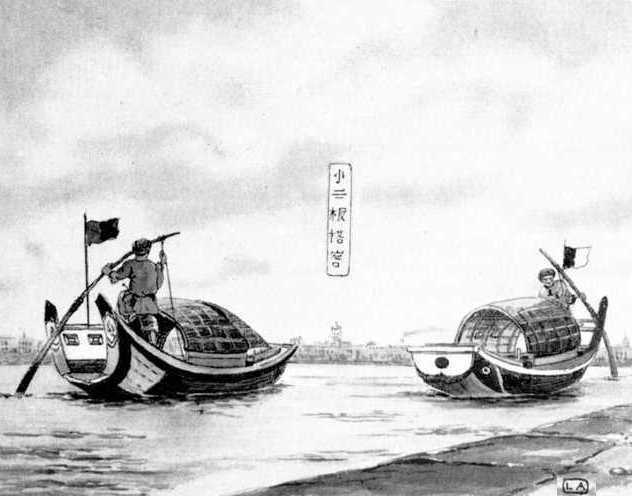 The sampan illustrated in Plate No.21 is 18 feet over-all, with a beam of 5 feet and depth of 2 feet. It draws only a few inches unless loaded to capacity, when there is the minimum of freeboard. There are three bulkheads, forming four compartments. In addition, there are two half-bulkheads and four frames. The fore part is decked, leaving a cockpit amidships which is covered with a small house made of closely woven matting arranged in three overlapping sections and painted white. Click here for enlarged section. In this portion the passengers are accommodated, and actually as many as five can be carried and even more; nine, however, is about the limit. In the after compartment is the galley, that is to say, a cooking-stove. Here, too, is the oarsman, who acts in the capacity of "owner-driver." He can, therefore, keep an eye on the meal that is cooking while he yulohs, if he is alone. If his family live on board, they also stow themselves away in this small space during working hours. In the fore compartment are stored the bedding, clothing, provisions, oil, charcoal, and extra cooking utensils. Propulsion is by means of a single yuloh, or lu, a quite original and extremely efficient implement which has already been described in detail; 13 feet in length, it is scarfed in three pieces, thus forming a gentle curve. The loom measures 2 feet 8 inches, the neck 2 feet 2 inches, and the blade 9 feet 8 inches, the overlapping portions being never less than 10 inches in length. When in operation the blade is kept very deep in the water, that is to say, 3 1/2 feet, or more than one-third of its length being below the surface, and as the face of the blade is 6 inches in width, this combination gives much increased leverage and power. The yuloh pivots on a 3-inch bearing-pin which ends in a knob. This pin is situated on the transom, and the loom is held in place by a coir lanyard, 5 1/2 feet long, attached to a ring-bolt in the deck. The hand holding the yuloh is held at head level and rather behind, while the hand on the lanyard works across the breast. It is interesting to record that the sculler can average 41 strokes to the minute under favourable weather conditions, yielding the satisfactory speed of 8 li per hour. 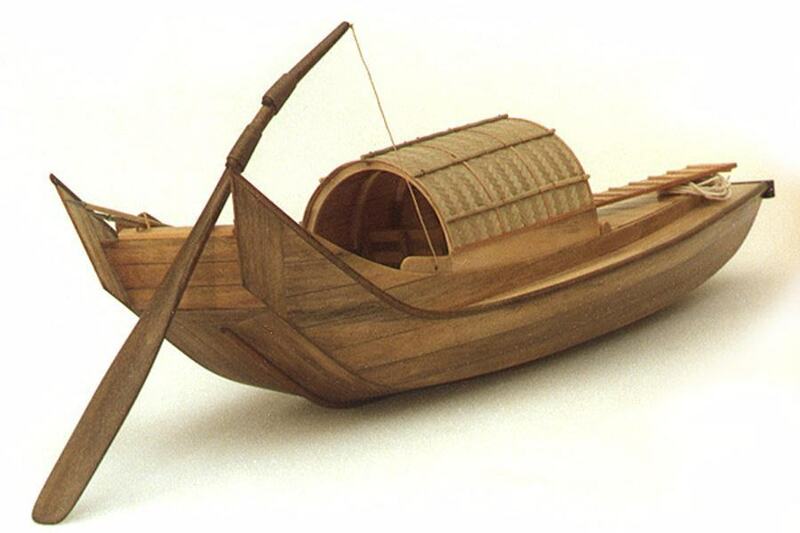 This type of boat is sometimes called the Ningpo sampan, and has many features in common with the Ningpo junk, such as the shape of the bow and stern, the free-flooding foremost compartment, the standard pattern of gaudy design, and, sometimes, the oculus. With the exception of the eye, which may or may not be present, these sampans are most markedly uniform in every particular, for all are of identical construction and size. Even the painted ornamentation on bow and stern hardly varies. Nevertheless, these boats fall into two definite categories, known as pang, or groups. These are the ning-pang, or group manned by Ningpo men, and the soo-pang, or group manned by either Soochow men, men of Shanghai, or men from Kiangyin, a small town some 80 miles up the Yangtze. The Soochow people, on the other hand, are universally popular, the women having a reputation for beauty and the men for an easy and graceful bearing. They must, moreover, have either more ingenuity or longer legs than the Ningpo men, for the sampan-dwellers sleep in pairs between the second and third bulkheads, which gives a space of 5 feet 4 inches. In the winter all the various groups sleep in the space between the first half-bulkhead and the first frame. Two sliding sections can be withdrawn from the first bulkhead to enable them to lie at full length. As already mentioned, the men of the soo-pang live in these small boats accompanied by their families. It is astonishing that so small an area can constitute a permanent home for two adults and several children while functioning in addition as a passenger-carrier. The wives and even the children of these sampan-dwellers can take their turn at the yuloh. They scornfully maintain that one reason why the women of Ningpo do not live afloat is that they suffer from seasickness and are unhandy in a boat. These sampans, of which there are to-day the record low figure of 813, are required to register with the harbour Police of the Chinese Maritime Customs. This is done annually, usually in April. No fee is charged for registration, but the sampanmen are required each to pay 40 cents towards the cost of the paint used in numbering the boats. On the hood, on each side of the registered number of the sampan, a coloured dot will be noticed. The colour is changed each year and shows at a glance when the boat was last registered. The harbour Police record the names, addresses, and other particulars of the boatmen and insist on the boats being kept seaworthy and clean. The sampanmen claim that they belong to the Customs and are very proud of this association. For the men of the other group, the ning-pang, the Shanghai sampan forms probably as clever an adaptation of a very limited space as it is possible to find, and combines the dual purpose of a passenger-boat and a two-roomed floating dwelling with a degree of seaworthiness surprising for its size. It has, in addition, the charm of pleasing lines and bright colours. It seems not improbable that this beautiful little craft will at no distant date vanish completely from the Whangpoo, and with it much of the romance and charm of the waterfront." 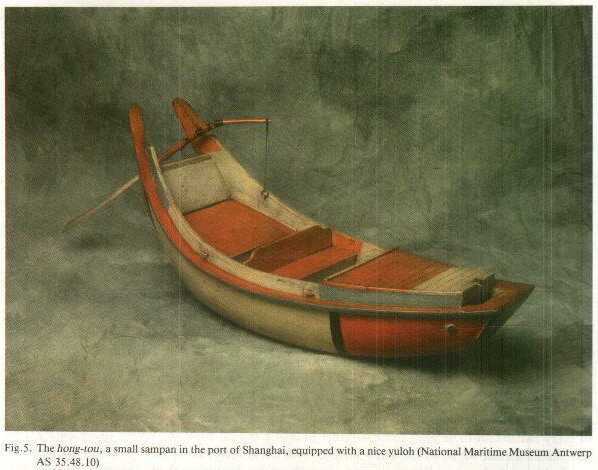 In December, Craig visited the Mariners Museum in Newport News, Virginia, and discovered a Shanghai Harbor Sampan in their small craft collection. Alongside it is a Burmese sampan which just shows in some of the pictures - not enough time to take pictures of them both, and due to the lighting and how crammed the boats are, sketches would have been much handier. But here are the photos and an essay anyway. Late-breaking news: Jerry Sousa from Hong Kong is restoring some sampans and other Asian small craft and he's sent me some pictures of the basket cases. When I have a chance I'll add the scans to a third page. Classic Boat 3/93; Vietnamese small boat, great article. Cheap Pages: from the Rudder ca. 1917. New: R/C Model by Tony Cardiff. Above: from Shaky Ships, published by the National Maritime Museum of Antwerp; shows all the characteristics in the sketches and in the Shanghai boat at the Mariners Museum. Below: from Audemard, Les Jonques Chinoises Vol 6. A sampan of a different sort, rigged with a simplified Chinese lugsail. Singapore harbor sampans were similar, but lower and perhaps a little narrower. Sampans this small usually hoisted no sails unless it was a very broad reach or a run downwind. More sampan sketches can be found on the Cheap Pages in H. Warington Smyth's Mast and Sail in Europe and Asia and in C.A. Andrade's Lessons from a Chinese Sampan. 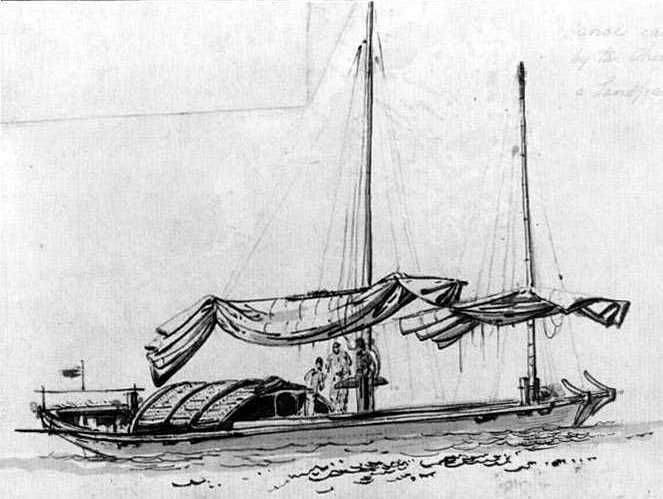 Shanghai Sampan drawn by William Maxwell Blake; available from the Smithsonian Ship Plans Collection. This plan was shortened and narrowed to make the boat Yam Seng in the recent Classic Boat. 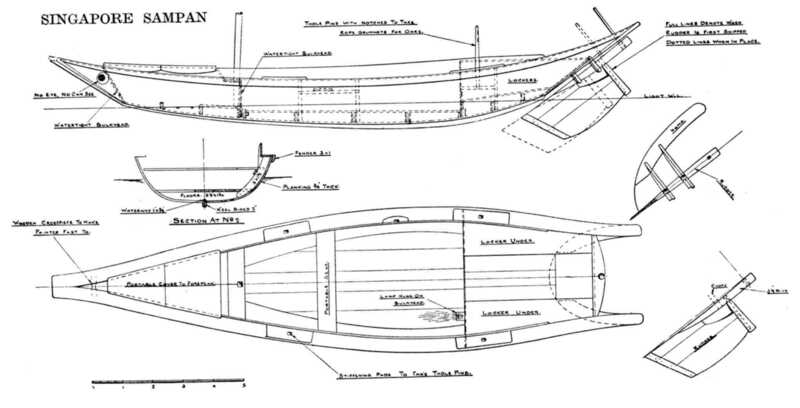 Below, just because it's almost never seen in books -- one of the earliest drawings of a large sampan, by John Webber, who sailed with Captain Cook. Although two-masted, longer, and lower it still has the same general profile as the small sampans. Drawings and photos from 100 to 150 years later show that these boats changed almost not at all. 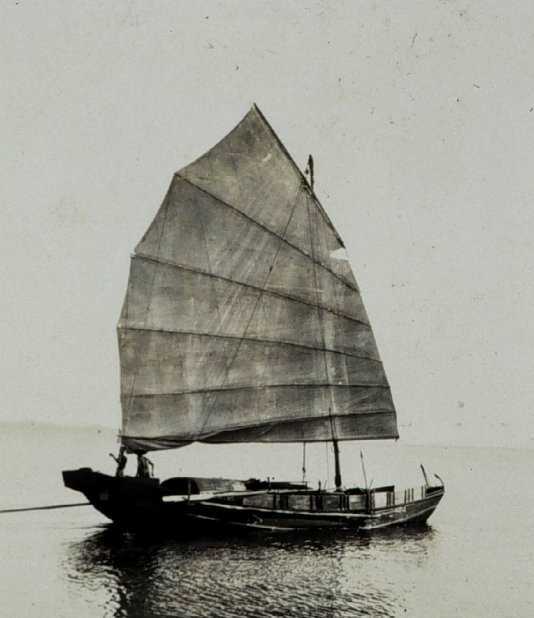 Compare Webber's drawing to this large sampan photographed in the Philippines by someone from the US Coast Survey, early 1900s.